Pearl and one of her favorite old spectres, Borris, at the Black Rose Cafe. Last Halloween was the last Halloween in Legacies 1891 which is no more. My room in the attic. There’s a communal bath tub behind the screen. 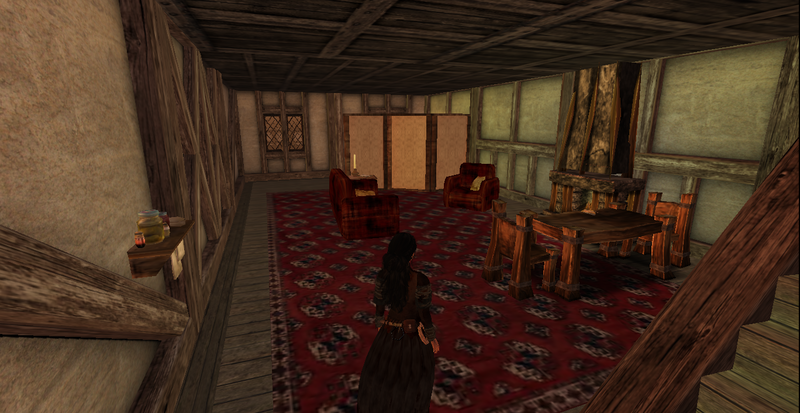 Most of the second floor is a common area for dining and sitting. I’m shuffling things around to find time to join a Medieval role play. It isn’t an historically accurate Medieval roleplay; it’s just that we wear closer to Medieval looking clothing and the furnishings and weapons are way more Medieval than not. My female character is not illiterate and I’ll explain that by saying she fled a convent. Yes she traveled alone to another city, a city that has at least one dragon. I love the sim build and have quite a few photos of it I haven’t shown here yet. 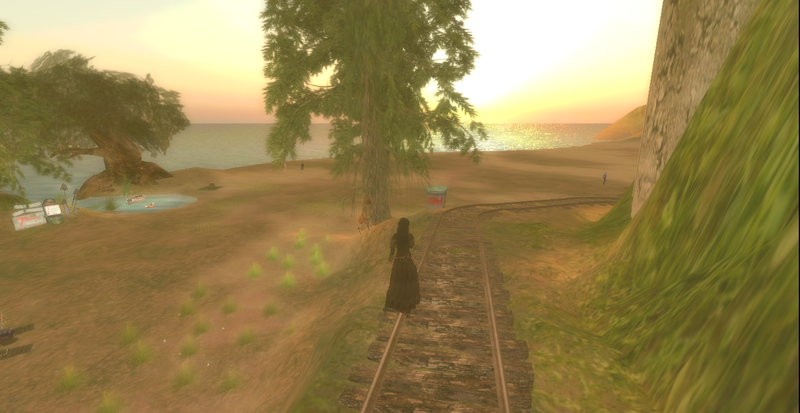 It uses the LaRPs HUD and meter which I like and the sim owners are very kind, reliable and patient so far. I don’t want to get disappointed again so I’m not renting yet. I have several kinds of foods I can place on the table. There’s a pie on it now. I also have a bowl of apples, a jar of mead and some glasses and a plate of fresh baked bread. While I was doing the shopping and placing of furnishings on Saturday, the sim builder brought in some foggy weather and it was very beautiful. My stone fence. Of course I’m proud of it and am not comparing it to what others can do. These moving, floating cubes is my favorite installation. It’s always good to rest, snack and stay hydrated. After tweaking things with my pc and checking out my drivers for what was longer than I cared to spend, I had a successful visit to BURN2. It was interesting and I took some photos but didn’t take notes about anything. I just wanted to enjoy it and put this blog out of my mind. What kept crossing my mind the most was seeing the installations and wanting to make my own. That was an unusual response, I thought, after a recent experience of creating three things in the Island Oasis virtual reality. Those objects took quite awhile and when you see the results, well…… they’re nowhere near the art at BURN2. BURN2 is worth visiting and I hope you enjoy the photos. I’ll have a few more of them to share on the weekend. I’ve made several attempts to attend BURN2 and my laptop, drivers and/or viewer can’t deal with it. Maybe it’s because I have too much I want to do right now that made my joining the Darkmoon Isle roleplay sim take longer than I expected. There were glitches with the meter and my trying to fix it got me in deeper. Somehow the typing animation got turned on in my AO and it took me awhile to figure that out. As of now, I believe I’m set. Both my friend and the sim builder were patient and kind which is much appreciated. 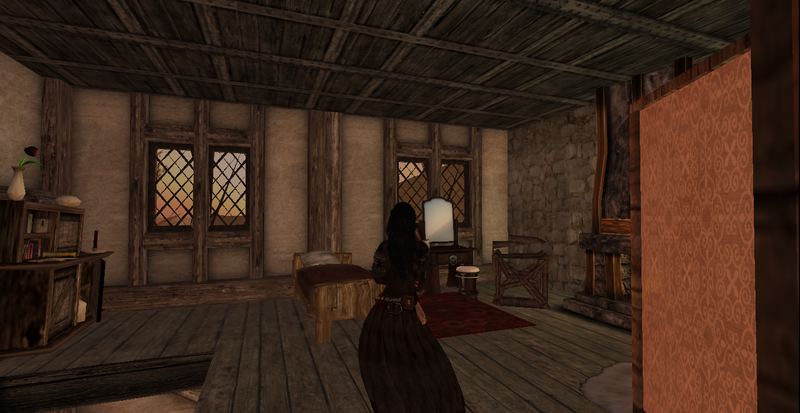 It’s a medieval sim and I’m a peasant so I won’t have to be changing clothes a lot. I’ll mostly be my usual pleasant, friendly character. I just don’t feel like being mean although I’ve certainly had to deal with my exasperated feelings in real life. Many other people are feeling that same way too, I can tell. We’re being called to be more authentic which isn’t popular. The photos were taken at Hobo Island during a visit Sunday evening. I’d been wishing I had building skills and quickly looked at a few areas listed in the destination guide as having resources. While exploring the Medieval countryside, Pearl chopped some wood for a family that wasn’t at home. Noticing that there was an ample supply of axes and that hers had become attached, she kept it as a sort of fashion accessory and carried it with her as she journeyed on. She encountered a 1000 year old Vampire shortly thereafter and found herself explaining that she wasn’t a warrior but was instead simply passing through. The greatest danger from the axe appears to be to herself as the way she swings it around while walking comes perilously close to splitting her skull open or whacking her thigh. She remains unruffled by that. She hasn’t been carrying it with her recently but it’s readily available along with her collection of red roses, quill pens, cups of coffee, glasses of red wine, datapads, automatic weapons, books, chickens, balloons and such. While my human has been preparing to begin an ambitious, complicated and long-term creative project, she’s let me relax and drink tea in Cherry Park instead of running me all over inworld. Maybe she’ll quit looking over my shoulder so much and just let me hang out for awhile. 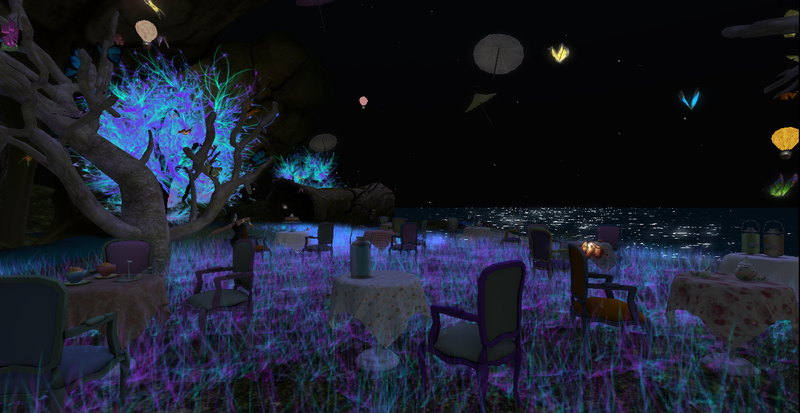 My favorite place on this sim is the small island with quirky tables and butterflies flitting around. There’s a wedding venue nearby which is lovely for residents who’re into that sort of thing. Recently I visited The Cherry Park which is the creation of Cherry Manga. There were lots of magical things to see and even a mysterious haunted tower. I’ll have a few more photos tomorrow. It was an enjoyable experience. I needed the break after signing up for an account at Island Oasis, which was an impulse decision after reading this. It wasn’t too difficult. I messed up getting my free island there but otherwise I’m doing O.K. for the amount of time I had to learn. The rental box for the free island needs to be clicked on once a week, which makes sense so they aren’t totally abandoned. The rules state that if it isn’t, the resident’s prims will be returned. I flew around and saw what looked like empty islands but on closer inspection they were rented. I got a bit hasty and when I saw a pink “available” rental box I clicked it and then noticed that someone had a gazebo, chairs and plants on the island. It seemed her items weren’t automatically returned when the rental expired and I never meant to grab someone’s space out from under them. I’ve put in a notecard about it and hope there is no awkwardness. What surprised me the most is that I’m now interested in learning to build. When I saw all the free textures available and found the sandbox with all the instructions on signs along the fence I was suddenly less intimidated about learning to make things. 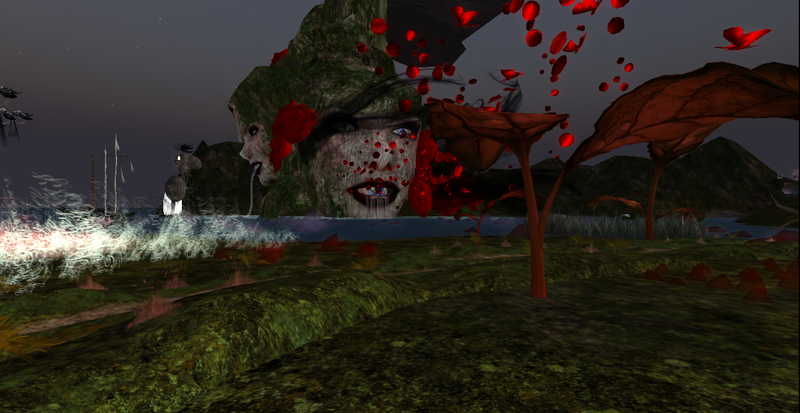 I might still be traumatized by how challenging Second Life was for me to learn. It’s difficult for me to learn things when other people are around, both in real life and in virtual reality. My avatar is named Wren Grey there. She isn’t as pretty as Pearl but we won’t tell her that. She has no interest at all in role play or dancing so I guess she isn’t much fun. But it seems she wants to try to make furniture and houses.